Here's an awesome idea for one of my homemade cake filling recipes. 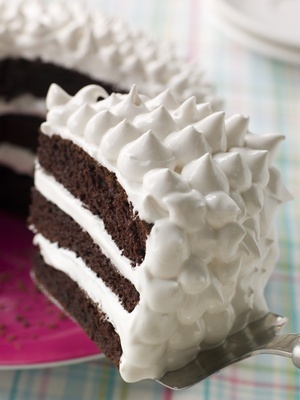 Bake a homemade Devil's Food Cake and fill it with the delectable homemade marshmallow filling (recipe below). Or frost this beauty with my famous homemade rocky road frosting then drizzle with caramel and chocolate sauce. Sound like heaven? It is. Are you ready to make some homemade cake filling recipes? Your cake will take on a whole new personality. All of these also work as cupcake filling recipes too. Mix the white sugar and corn syrup together in a saucepan; bring to a boil. Remove from the heat and stir in gelatin which has been softened in the cold water. Chill mixture in the refrigerator until it is cold and very thick. When it is thick, bring it out and beat it on high for 6 to 8 minutes or until very fluffy. You may also use this for frosting and filling as shown with Devil's Food Cake (photo above). Delicious. This lemon cream tastes less buttery than my Lemon Curd Recipe above and a little tangier. Use it to make a tart, fill a cake, or serve it alongside cookies or bread. Have an instant read thermometer, a strainer and a blender at hand. Bring a few inches of water to a simmer in a saucepan. Put the sugar and zest in a large heatproof bowl that can be set over the pan of simmering water. First rub the sugar and zest together between your fingers until the sugar is moist and very aromatic. Whisk in the eggs, followed by the lemon juice. Set the bowl over the pan of simmering water and start stirring with a whisk as soon as the mixture feels tepid to the touch. Cook the cream until it reaches 180 degrees; whisking constantly to keep the eggs from scrambling. As you whisk, you’ll see that the cream will start out light and foamy, then the bubbles will get bigger and start to thicken; the whisk will leave tracks. When this happens it’s almost ready, DO NOT stop whisking - depending on how much heat you are giving the cream, it may take as long as 10 minutes to reach the temperature. As soon as it reaches 180 degrees, remove from the heat and strain it into a blender; discard the zest. Let it sit at room temperature, stirring occasionally until it cools to 140 degrees; approximately 10 minutes. Turn the blender to high and with the appliance running, add the butter - about 5 pieces at a time. Scrape down the sides as needed as you incorporate the butter. Once the butter is in, blend for another 3 minutes or until it’s light and airy. Pour into an airtight container and chill for at least 4 hours, or overnight. Before using it, give it a stir. The next homemade cake filling recipe is cream, light and fluffy. You can fill a cake or cupcakes with this dreamy filling. You just may want to grab a teaspoon and eat away. I used this recipe for the filling in my Victoria Sponge Cake (see photo above). Combine the cream cheese, sugar and vanilla extract in a large mixing bowl or the bowl of a stand mixer and start beating on medium until smooth. Fit the mixer with the whisk attachment if you have one. While the mixture is still whipping, slowly pour in the heavy cream. Stop and scrape the bottom of the bowl a couple of times while you continue whipping until the cream can hold a stiff peak. This chocolate cake filling recipe from scratch is easy to throw together when you don't have the time to fuss. Great for angel food cake - fill hole; frost sides and top too (keep chilled). Fill the bottom of a saucepan with water and bring it to a simmer. Put the chocolate, butter and 1/2 cup water in a heatproof bowl and place over simmering water until chocolate melts. Dissolve the gelatin in 1/3 cup of water; adding to the melted chocolate mixture. Cool slightly. Now add the powdered sugar and when the mixture starts to set - fold in the heavy cream that you whipped earlier. Chill until ready to fill a cake/cupcakes, etc. This is another cake filling recipe that you will use often. Place flour, sugar and milk in a double boiler and cook over boiling water until thick. Cool. Cream butter, powdered sugar, cocoa and vanilla in a mixing bowl and add to the cooled milk mixture. Beat thoroughly. Cut cake in three horizontal layers; spreading the filling between the layers. Chill before serving. Enjoy. It's great. Here's another refreshing and delicious cake filling recipe. Perfect if you use this filling layered in a homemade white cake from scratch. Perfect. In a mixing bowl, beat topping mix and milk on high speed for 4 minutes or until thickened. Combine melted chips and jam; gradually beat into topping. Set aside 1 cup of this whipped mixture to mix in with the filling. Cover and chill remaining mixture for 20 minutes or until it reaches spreading consistency. Add pineapple and strawberries to reserved 1 cup of whipped filling mixture. Place one cake layer on a serving plate; spread with fruit mixture. Top with remaining cake layer. Frost top and sides of cake with chilled topping. Store in the refrigerator. This cake filling recipe goes great with my homemade orange cream cheese frosting from scratch. There is a note below that will change the recipe to orange frosting. Mix flour, sugar and salt together. Add water and mix. Add orange juice, lemon juice and the rind of the lemon and orange. Cook on low heat until thick and the mixture becomes translucent. Beat egg yolks. Add some hot mixture to the yolks (to temper them); adding to mixture in saucepan and whisk constantly. Return back to the heat and cook slowly until thick. Add 1 cup of coconut if desired. Fills a three layer cake.